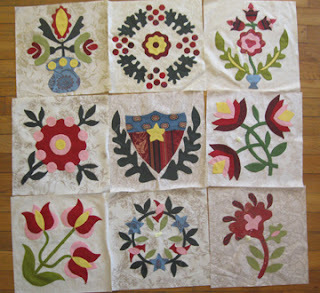 I've been putting off setting my applique blocks for last year's Northern Lily/Southern Rose quilt. 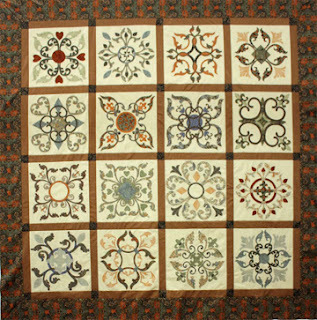 At Moda we originally did the pattern for a block of the month in an unpdated color scheme and contemporary set for the Civil War Reunion fabric collection but I did a group of blocks on ivory prints for an old-fashioned look. 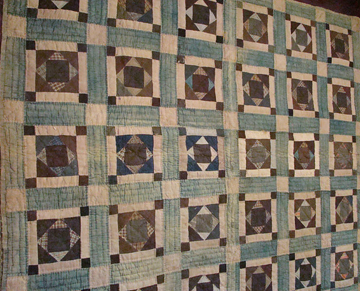 I was inspired to get the blocks out by Ilyse's quilt, which is now not only sashed but bordered and awaiting closer quilting. 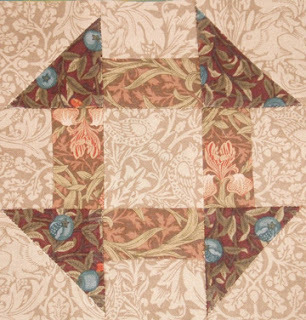 The pattern called for 12" blocks. Ilyse made her blocks smaller. I thought about just putting them side by side which can look too chaotic. 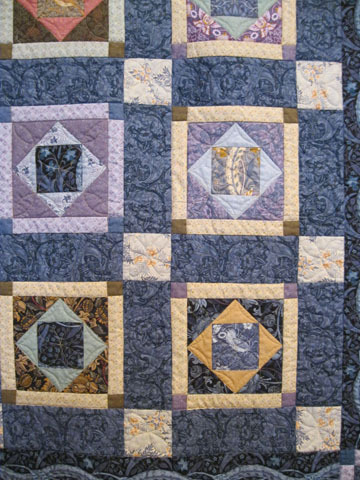 Alternating with plain blocks might be too dull. 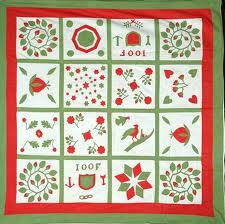 ...from Baltimore about 1850 till the end of the century. And then there are green strips. 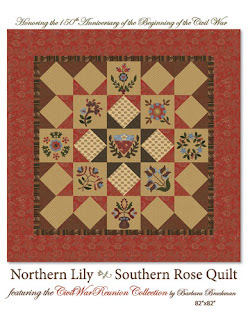 Jerri McReynolds used green strips on her Northern Lily and it looked great. I decided on a red stripe, sort of wide. 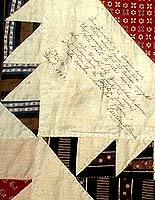 I noticed that mid-century quilters often just ran the stripe like that with no cornerstones to break up the sashing. 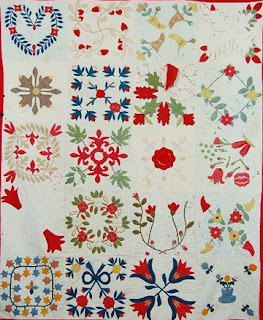 I am awaiting not only inspiration but the yardage for my next Civil War reproduction line for a final border. 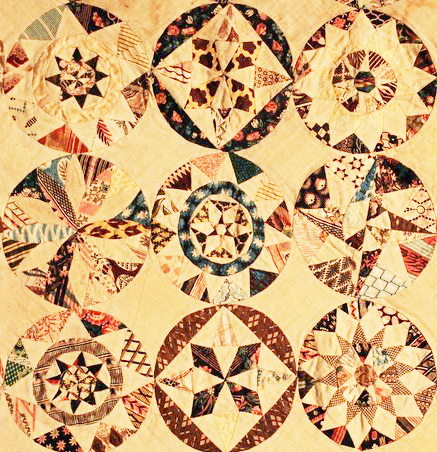 The pattern is out-of-print and the Civil War Reunion fabric is long gone, but I did find two online sources that still have patterns and kits. 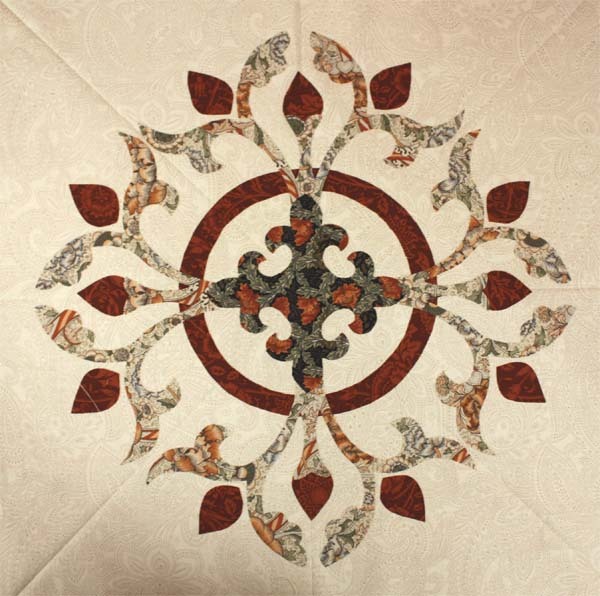 You can ask your local shop if they have any of the patterns left. 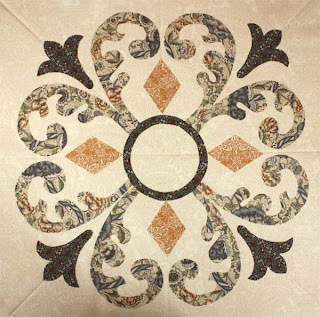 The next Civil War collection will be called Metropolitan Fair and I expect to get some yardage right before the May Quilt Market. This quilt from England's Cheltenham Museum is all the rage right now on the internet. 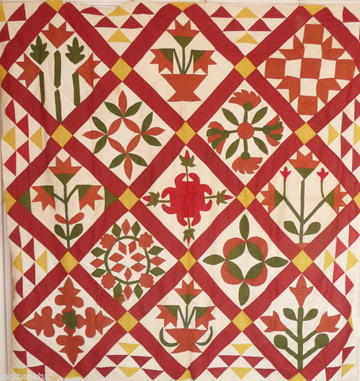 It's identified as a wedding quilt by Irishwoman Jane Pizar dated 1860. 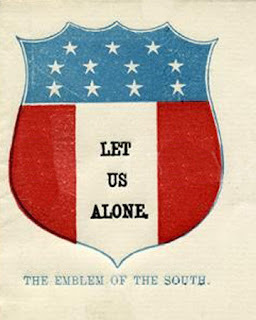 But that date of 1860 just doesn't ring true. 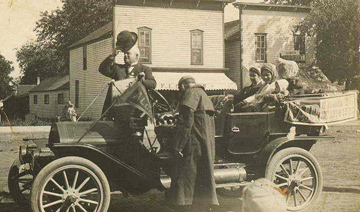 It must be older than that. 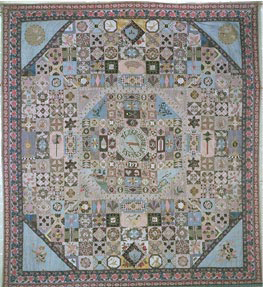 It immediately calls to mind the spectacular quilt below in the collection of the Victoria and Albert Museum. George III reviewing the troops is attributed to about 1805. 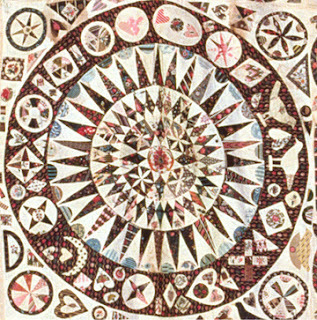 It has the same circular center in a field of complex patchwork. 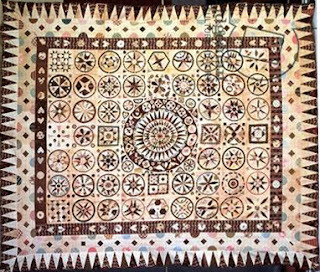 The piecing in both is a variety of wheels. 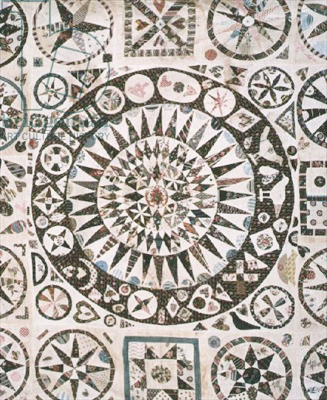 It's hard to distinguish between the two quilts in closeup. 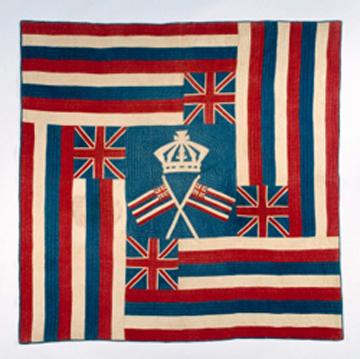 Which is the V and A's from1805 and which the Cheltenham Museum's from 1860? 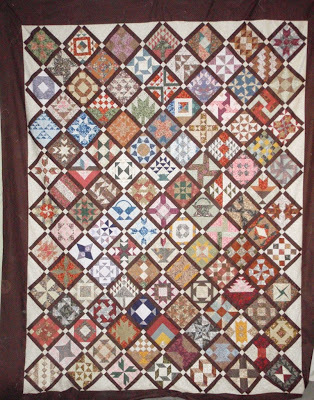 The patchwork style seems older than 1860. Closeups from Sue's blog also indicate that the prints are older too. 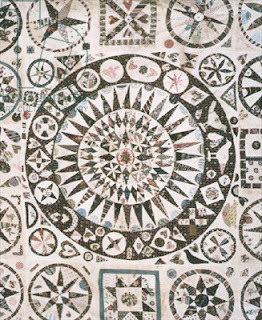 They look much like another quilt in the V and A's collection, the 1797 quilt with a sundial in the center of a field of complex patchwork. The prints in this quilt have a distinctive palette and detail. 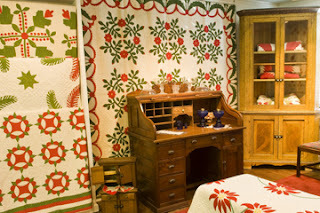 I am just going by photos on the internet but I bet (based on style and fabrics) that quilt is about 1800-1820. 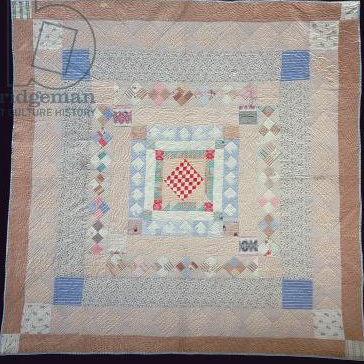 When you do a search in that Bridgeman site for Jane Pizar two quilts come up. 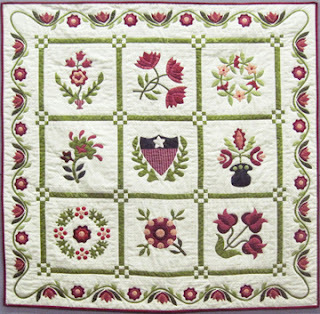 I am guessing this simpler medallion with red in the center is the actual 1860 wedding quilt. 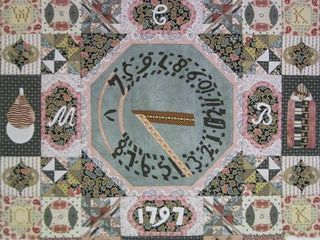 It's much more typical of that date. They may have mixed up the labels. Comparison A:. 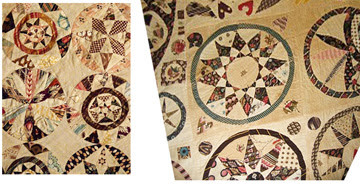 V and A quilt on the left (1805), Cheltenham Museum's on the right. 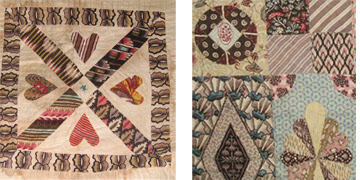 Comparison B: Cheltenham Museum's on the left, V and A quilt on the right (1797). 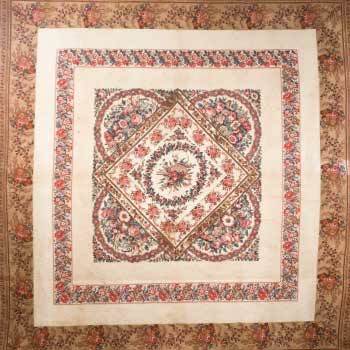 Carolyn Konig has patterned both at Carolyn's Quilting Room in Victoria. She calls the sunburst medallion the Wedding Quilt. 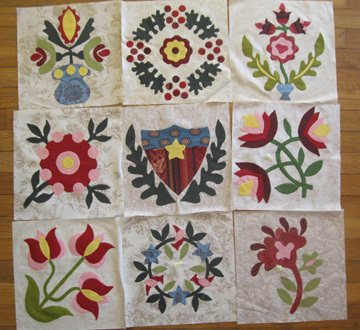 Sheila (The Quilting Gammy) made blocks from the Farmer's Wife sampler in William Morris reproduction prints. I found this quilt I made last year in the stack of unphotographed miniquilts. 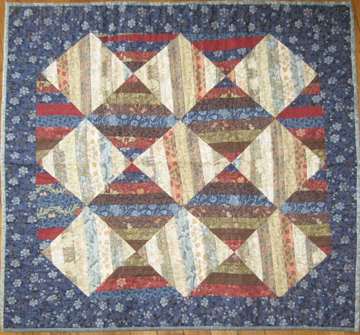 I used a package of 1-1/2" precuts, sorted them out by value into lights and darks and made a strip quilt by piecing strips along the diagonal. 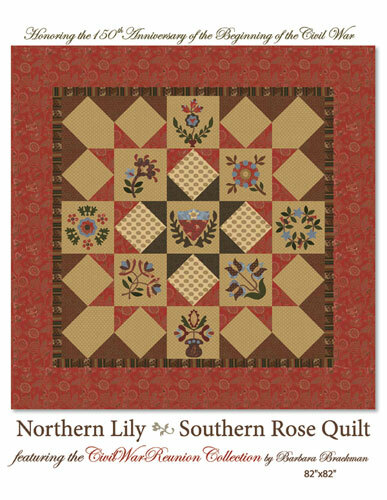 The ever creative women at Common Threads in Waxahachie, Texas have kitted up the Southern Gentleman pattern by Sindy Rodenmayer in Morris & Company prints. 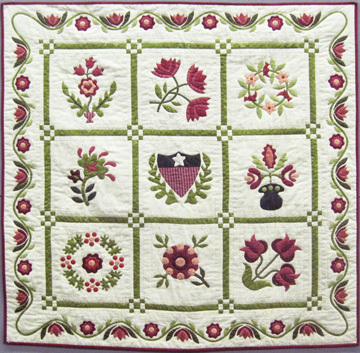 Penny Pierce is teaching a class in embroidery. 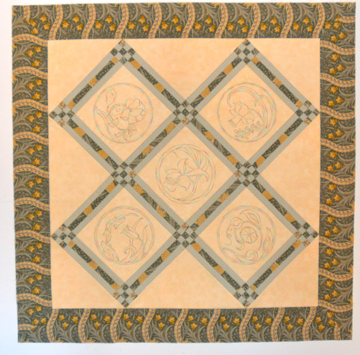 For her sampler she used 1 metre of the Daffodil print from my Morris Tapestry collection. 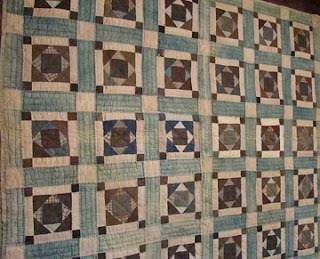 She said it's a good thing she's Canadian so she got a metre instead of a yard, because she couldn't have gotten all the sashing and the border out of a yard. I don't think I ever posted a picture of Roseanne Smith's "square in a square" quilt finished. 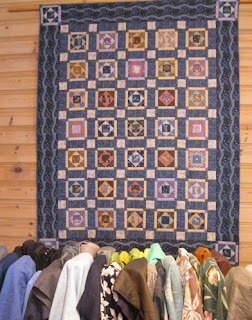 Here it is hanging down at Sarah's Fabrics. She framed square in a square blocks with strips and cornerstones and then added wider strips and cornerstones. 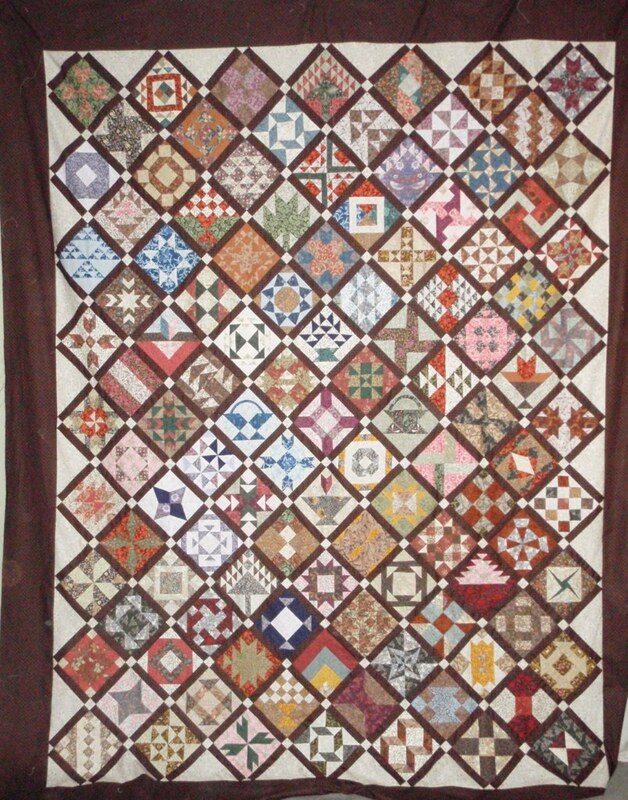 Her inspiration was this quilt from about 1900 she saw on an online auction. 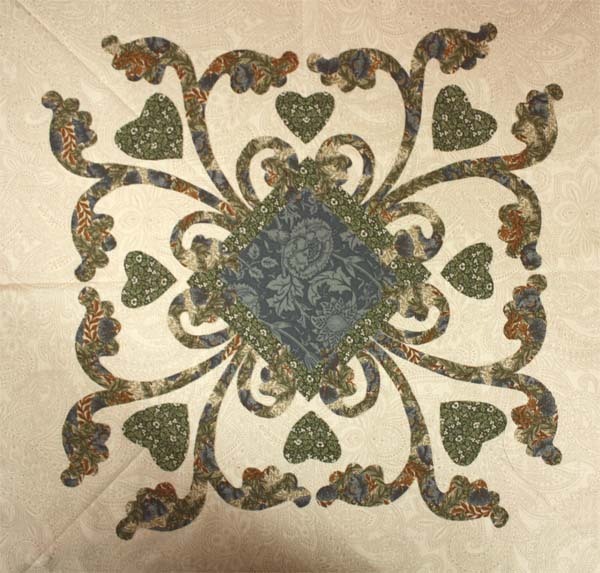 Send me pictures of stuff you make from these Morris prints and I'll post them here and on my Pinterest board. 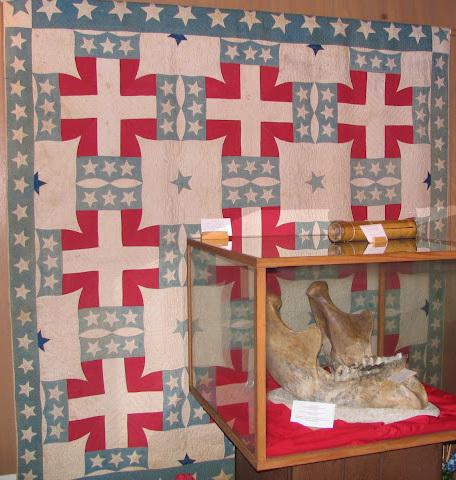 I came across this quilt recently in somebody's vacation snapshots, taken in a small Texas museum: a quilt behind a fossil case (probably fading away in the light.) 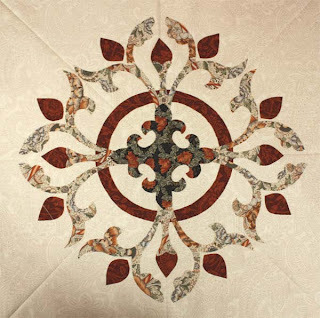 What a strange pattern. But you know it could be a Civil War quilt. 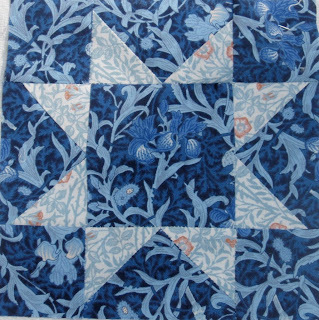 It's hard to tell the age of a quilt from a photo and the fabrics all seem to be solids. 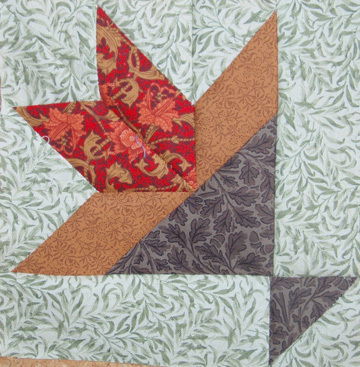 Very little help. 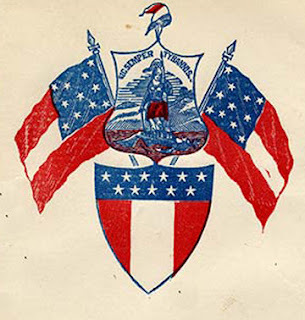 But there is nothing to say that it's not 1860-1900. 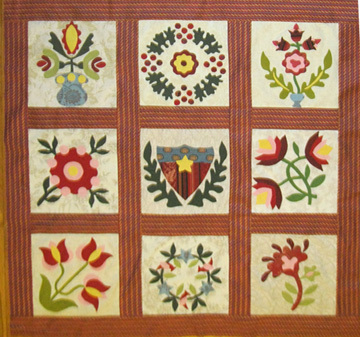 That star appliqued border is intriguing. I have probably seen ten or more Civil War quilts with the same border, taken from the 1861 Union quilt pattern published in Peterson's Magazine. 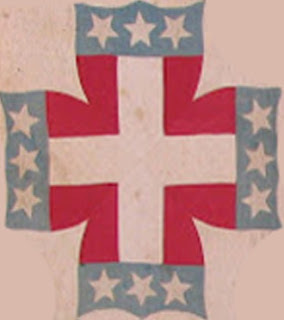 And the block---is that four shields? And then I came across this image on a Civil War envelope. 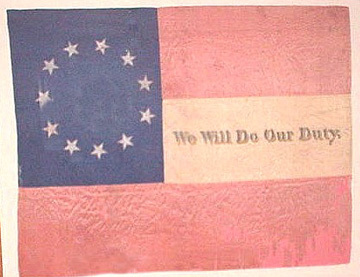 I'd seen dozens of Union envelopes from the War, but never a Confederate envelope. I had never noticed "The Emblem of the South," a shield with three stripes just like the first flags. 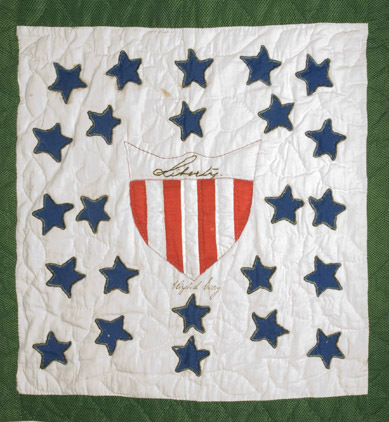 So I looked at my files of Confederate quilts (a very small file). Here's the same shield in Varina Davis's post-war memorial quilt. Union shields (these two are from Union quilts) have more stripes. That Texas quilt needs better documentation and conservation. Time to pack up the car for spring and summer quilt show travel. 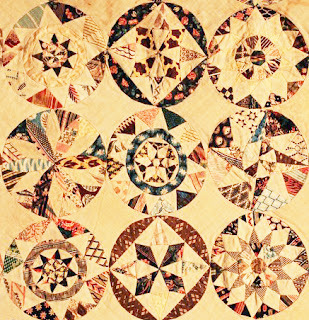 Here's a list of shows of antique quilts for spring and summer planning. 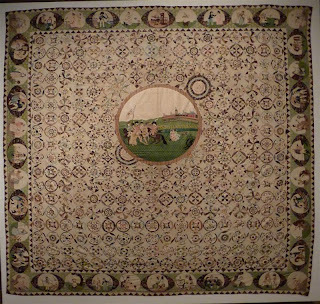 It's not quilts at the Legion of Honor but it's worth a trip. 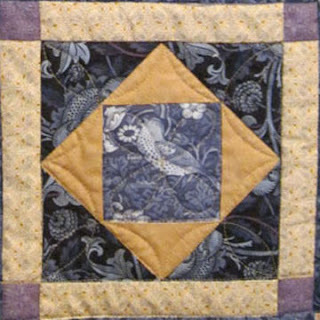 San Jose Museum of Quilts & Textiles: Creating Community: Quilts as Women’s Shelter, featuring an exploration of signature/friendship quilts, through April 29, 2012. Wadsworth Athenaeum: Colts & Quilts: The Civil War Remembered. 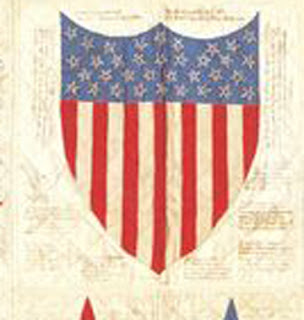 For the 150th anniversary of the Civil War an exhibit of costumes, decorative arts, and paintings arranged in vignettes that narrate personal stories and reactions to the war. Through May 6. 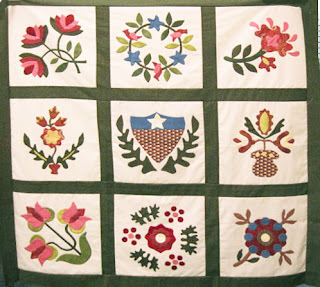 Wylie House is displaying about 20 quilts from their collection on the house's beds through March 31. 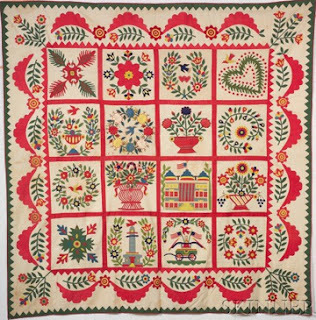 Indiana, Goshen Goshen College: Quilts from the Permanent Collection from the Mennonite Historical Library will be on display at the Good Library Gallery from March 25 to July 6. Western Kentucky University, The new Elizabeth Richardson Quilt Gallery will have rotating exhibits of quilts and textiles. 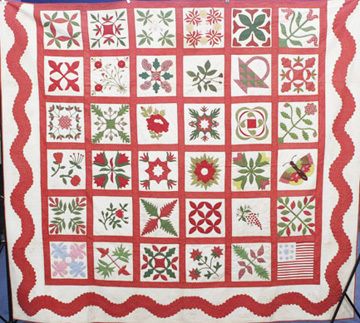 Up now, mid-20th century quilts from the Richardson collection and 15 star quilts from the Kentucky Museum Quilt Collection. 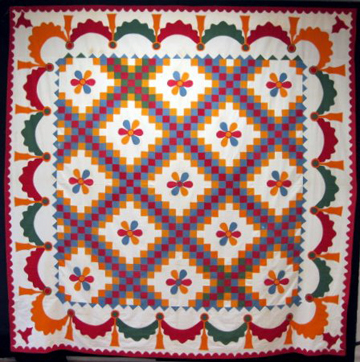 Kentucky, Paducah Rotary Antique Quilt Show at the annual AQS event: Eagles, Stars & Bars curated by Pat & Arlan Christ April 24-28th. 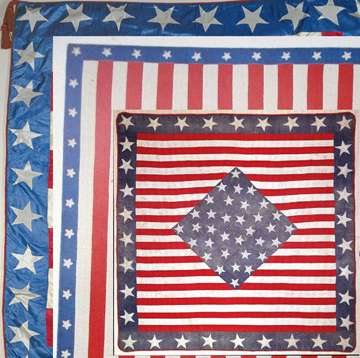 New England Quilt Museum: Campaigns and Commemoratives highlights four centuries of political textiles used in quilts to support the campaigns of everyone from President Washington to President Obama. 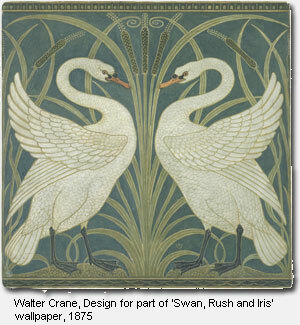 Through March 24. 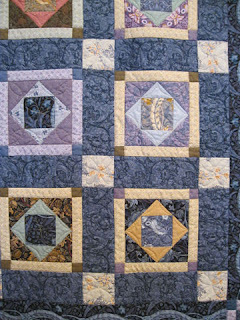 The Lowell Quilt Festival with shows is August 9-11. What's In A Name? 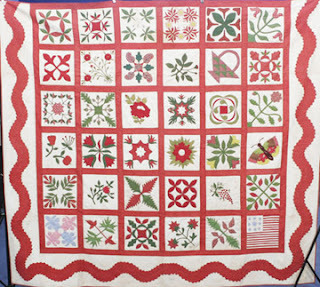 Inscribed Quilts, through December 3, 2012. A Tribute to Ardis James, through July 29. Quilts of the Homesteading Era. 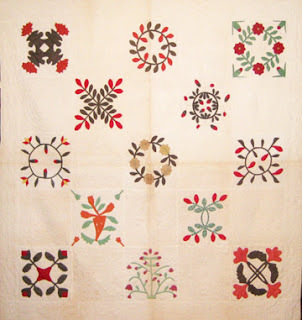 Brookside Museum: The Threads of Time explores the history of quilting in the county in over 20 quilts, through January, 2013. 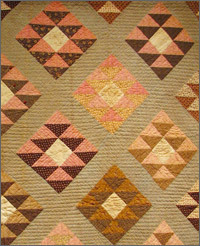 Kent State University Museum: On the Home Front: Civil War Fashions and Domestic Life through August 26, 2012, featuring Elizabeth Keckley's famous silk quilt. Packwood House Museum: Pennsylvania Quilts II: Patterns and Variations, June 12-October 13. 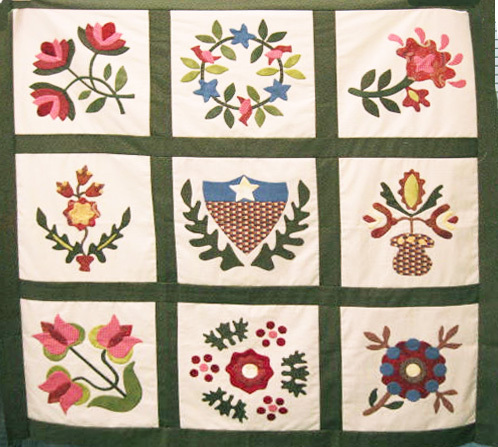 Their Annual Quilt Weekend program is August 10-12 with workshops and presentations. Palmer Museum of Art at Penn State: American Quilts from the Terasaki Collection organized by the Herbert F. Johnson Museum of Art at Cornell University, June 12–August 26, 2012. Charleston Museum: Botanical Quilts features many of their spectacular chintz quilts through April 22. 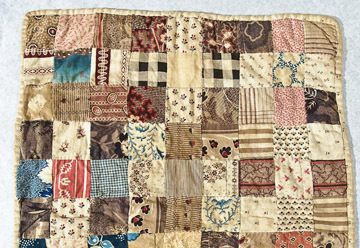 Also Charleston Couture, featuring over 50 garments, from pleated silk gowns of the 1770s to velvet dresses worn by notable Charlestonian ladies in the 1930s, through November 4. 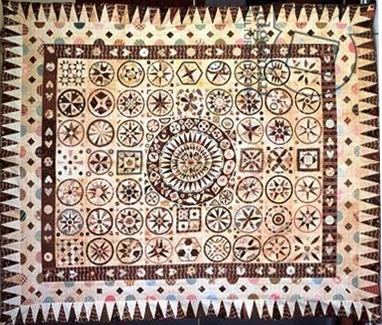 Colonial Williamsburg: Material Witnesses: Quilts and Their Makers features textiles made from Virginia to the Polynesian Islands. 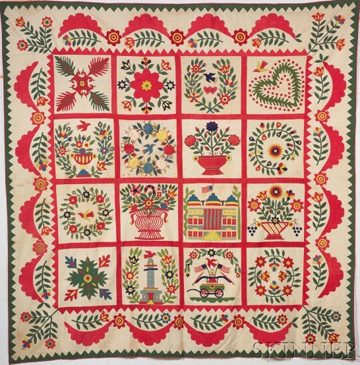 "Colonial Williamsburg curators have uncovered the stories of the past through the study and research of these quilts and coverlets, some of which were created as early as the 1830s." 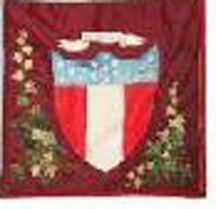 Through May 28, 2012.